Many people rely on central heating systems to provide heat during winter. The irony is, in as much as people depend on the systems, they do not take annual servicing seriously. What happens? The system develops small problems and since no one attends to them, they escalate into big issues. The system breaks down and it becomes impossible for you to diagnose where the problem is since you have not been servicing your system. Unfortunately, you end up suffering the consequences which include lack of hot water and source of warmth for some time. You have two choices; either to repair the system or to replace it. Instead of the inconveniences, why not service your boiler? Apart from servicing, you need to know the common central heating issues and how to diagnose them. With this knowledge, you can diagnose a problem and deal with it before it becomes serious. Sediments can prevent hot water from travelling well though the plumbing system. The solution for the situation is power flushing or replacing whole sections. Our technicians will definitely advice you to flush the system as it is more cost effective. Do not try to flush the system if you are not a professional plumber. You need someone who is knowledgeable and experienced so that it does not lead to fatalities. Flushing can lead to more damages on the system, injuries and even death if it is done by untrained person. We are trained, qualified and experienced in correcting any central heating repairs in Leeds. Noisy pipes making clicking and twanging noises are a clear indication that there is a leaking pipe. When a pipe leaks, the water flows to the radiator thereby interfering with its functionality and the central system does not work. You need a plumber and a structural engineer to determine the extent of the leakage. Any leakage requires immediate attention to cut down the expenses due to loss of water. We are ready to help you restore your system the same day. If you realize that your central heating is not producing heat, test if there is hot water. If there is hot water, then there could be air in the radiators. Trapped air prevents the radiators from working properly. Some radiators stop working completely if there is trapped air. The air creates cold spots which when removed the system functions properly. Our technicians will correct the situation by bleeding the system. After bleeding, the system will function normally unless there is another problem. An old central heating system requires constant repairs which mean unlimited inconveniences. There is no need for you to keep paying for repairs every now and then as it makes no economic sense. Spare parts for old systems run out of stock and at times you have to wait for a long before getting the parts. If your system is more than 10 years old, it is time to replace the heating system. We have a variety of boilers from different manufacturers which you can choose from. 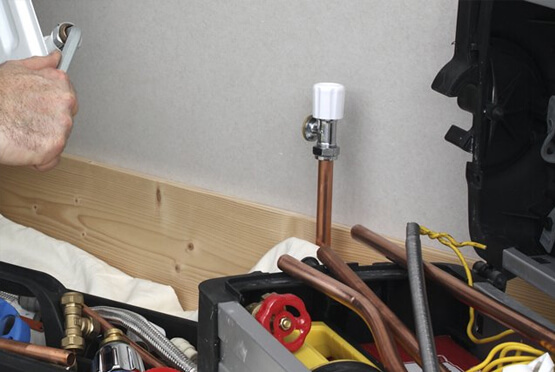 We will also install the system for you and if you want continued service in Morley, Headingley, Wetherby, Castleford, or Holbeck, we will provide for you.